I've got temperature sensors outside too. 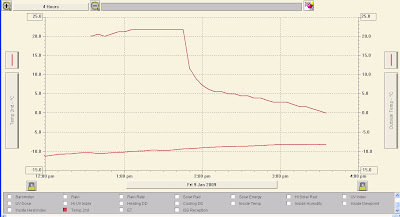 What software are you using to produce your temperature charts? The software's called WeatherLink - which comes from Davis Instruments, whose weather station we're using. Today it's recording the outside temperature as around -15, while the greenhouse is at +5 - quite an impressive difference! Oh I see sensor and PC are linked. Neat! No good for me then as I've got different sensors. Never mind, I'll just have to stick with my manual/Excel system!